We provide services to the complete satisfaction of our clients ! 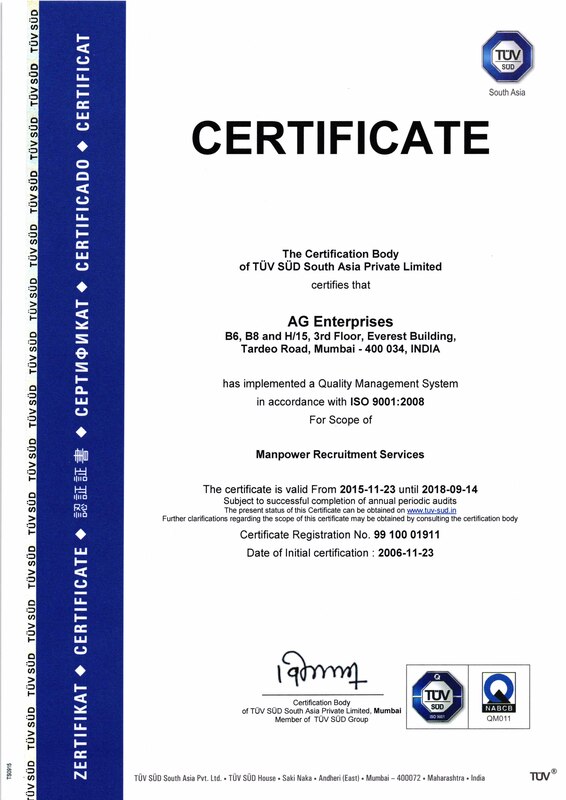 A.G. Enterprises is one of the TOP TEN International Recruiting firms duly recognized by the Government of India. We are specialized in placing Human Resources to wide variety of industries such as Oil, Gas & Petrochemical, Civil Construction, Hospitality, Information Technology , etc. globally. We are one of the largest and most successful search and recruiting organization in the world and are operating since more than 3 decades. Our powerhouse comprises of professionals from different disciplines having extensive experience in the field of recruitment services. We develop one-on-one relationships with our clients and candidates, with a view to help them make the right staffing decisions and career choices. Our Office is in Mumbai, the financial capital of India. Strategically located in the heart of the city, the best known Hotels in Mumbai are very near to us. We provide unmatched services to our clients by thoroughly understanding and responding to their needs. In the process we demonst. To cater to industry specific needs, we have separate divisions for each industry like Construction, Oil, Gas & Petrochemicals, Health Care, Hospitality, Information Technology, etc. We provide our clients with the best professionals in their selected industry. We have experienced HR panel which comprises of Specialized Engineers, Doctors, Chartered Accountants, Lawyers and HR Consultants. More than 40 years in International Recruitment services. Full Fledged State-of-the-art Infrastructure and highly qualified and experienced team of professionals Network all over India and in neighboring countries of Bangladesh, Sri Lanka and Nepal Access to 5 million plus quality live Databank comprising all Category of Professionals Immediate response to Client queries Dedicated, Professional and experienced Recruitment Team. To create a global network of competent and honest service providers in sourcing and placement of Human Resources with the help of Internet Technology & Media support with proactive recruitment methodology, in a mutual benefit to all concerned - ourselves, our clients as well as the professionals themselves. Trade Tests for all technical categories are conducted at independent third party testing centers. For specialized skill testing, we have necessary arrangements with the local government recognized technical institutes. An excellent rapport with various Airline staff gives us that extra advantage that becomes critical in getting setas during rush season. © A.G Enterprises All Rights Reserved.